"Do I choose my teammates and my career? Or do I choose my family?" LaRoche said in his statement. "The decision was easy, but in no way was it a reflection of how I feel about my teammates, manager, general manager or the club’s owner Jerry Reinsdorf"
Adam LaRoche has spoken out for the first time since announcing his retirement this week, saying he felt it was "necessary to provide my perspective" after days of controversy surrounding the reason why the first baseman left the Chicago White Sox. "Though I clearly indicated to both teams the importance of having my son with me, I also made clear that if there was ever a moment when a teammate, coach or manager was made to feel uncomfortable, then I would immediately address it," he said in a statement released on Twitter Friday. "I realize that this is their office and their career, and it would not be fair to the team if anybody in the clubhouse was unhappy with the situation. Fortunately, that problem never developed." 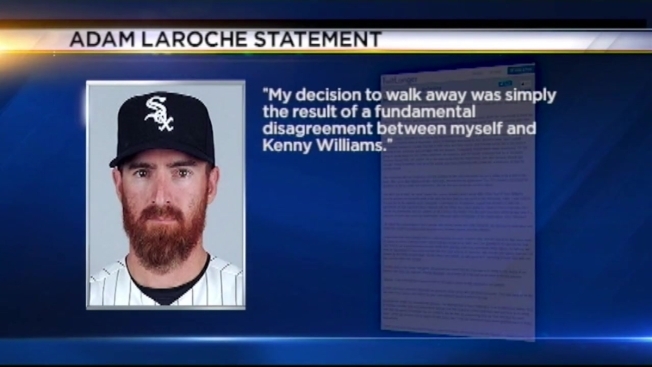 LaRoche continued to say there were no problems with him or his son during the 2015 season but contradicted statements made by White Sox VP Kenny Williams on the current season. "With all of this in mind, we move toward the current situation which arose after White Sox VP Ken Williams recently advised me to significantly scale back the time that my son spent in the clubhouse. Later, I was told not to bring him to the ballpark at all," LaRoche said. "Obviously, I expressed my displeasure toward this decision to alter the agreement we had reached before I signed with the White Sox. Upon doing so, I had to make a decision. Do I choose my teammates and my career? Or do I choose my family? The decision was easy, but in no way was it a reflection of how I feel about my teammates, manager, general manager or the club’s owner Jerry Reinsdorf." The controversy began earlier this week when LaRoche announced that he intended to retire for personal reasons. Over the intervening days, it was revealed that the reason for LaRoche’s decision was that the team, specifically Williams, had asked him to dial back the amount of time the first baseman’s 14-year-old son Drake spent in the clubhouse during the season. "[Drake is] very welcome just as all our players kids are and always have been, really," Williams told NBC Chicago's Peggy Kusinski Wednesday. "I mean our policy is not changing. The thing I asked for in this particular situation was for it to be not an everyday thing and to dial it back." Players reportedly were furious with the team’s decision and the process behind it, and star pitcher Chris Sale later went on an expletive-laden tirade against Williams in a closed-door meeting at the clubhouse. Sale, standing in front of his locker that contained jerseys for both LaRoche and his son Drake, blasted Williams for his handling of the situation and alleged the players were lied to. Williams declined to comment on whether any players had complained about Drake's presence, but said Drake is "loved by everyone around here" and applauded the players for standing behind LaRoche. LaRoche said he is certain he would regret not spending enough time with his son. "I will leave you with the same advice that I left my teammates. In life, we’re all faced with difficult decisions and will have a choice to make," he said. "Do we act based on the consequences, or do we act on what we know and believe in our hearts to be right? I choose the latter." Given the suddenness of my departure and the stir it has caused in both the media and the clubhouse, I feel it’s necessary to provide my perspective. I understand that many people will not understand my decision. I respect that, and all I ask is for that same level of respect in return. I live by certain values that are rooted in my faith, and I am grateful to my parents for that. I have tried to set a good example on and off the field and live a life that represents these values. As fathers, we have an opportunity to help mold our kids into men and women of character, with morals and values that can’t be shaken by the world around them. Of one thing I am certain: we will regret NOT spending enough time with our kids, not the other way around. At every level of my career, the game of baseball has reinforced the importance of family to me. Being at my father’s side when he coached. Playing alongside my brothers as a kid and as an adult in the big leagues. Likewise, it has been great to have my son by my side to share in this experience as I played. In each and every instance, baseball has given me some of my life’s greatest memories. This was likely to be the last year of my career, and there’s no way I was going to spend it without my son. Baseball has taught me countless life lessons. I’ve learned how to face challenges, how to overcome failure, how to maintain humility, and most importantly, to trust that the Lord is in control and that I was put here to do more than play the game of baseball. We are called to live life with an unwavering love for God and love for each other. These are lessons I try to teach my kids every day. I truly am blessed to have been granted each of those experiences. Thank you to all of my previous managers, past teammates and friends across the league for making these past 12 years such a wonderful journey, and for providing me with memories that I will never forget--especially the ones with my son by my side. I will leave you with the same advice that I left my teammates. In life, we’re all faced with difficult decisions and will have a choice to make. Do we act based on the consequences, or do we act on what we know and believe in our hearts to be right? I choose the latter.